The quay alongside the Pont d’Austerlitz is a sad affair. Trapped between a busy main road and a rusting Salvation Army hulk this riverside location sees few visitors. As Metro trains rattle overhead and weeds rustle gently in the winds, it is difficult to imagine that this is the point where two rivers previously met. 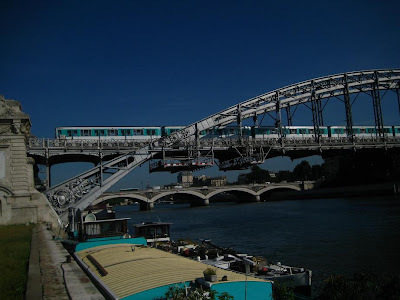 The Seine continues to flow by, lifting and dropping the creaking derelict boat, but its little cousin, the Bièvre has long since been covered over and diverted down long tunnels to a sewage works in the suburb of Achères. I won’t try to tell the full story of the River Bièvre nor attempt a description of where it used to run through the city. My interest is focussed more on the emotional issues connected to this subject. Why has this river taken on almost mythical proportions in Paris today, and what are the dangers to a city of covering over a river blocking the flow to its natural receptor? We have accepted the concretisation of our cities, of seeing trees and fields make way for houses and roads, but the disappearance of a river into the city sewers still seems like an aberration. Local residents have called for the unearthing of the Bièvre, but will this banished Parisian river ever see the skies above the city again? The first thing to point out is that it is still a living waterway. It still has the same source near Versailles and still flows gently through the more rural outskirts of Paris. As it approaches the city though it becomes harder to spot before disappearing underground completely beyond the Parc Heller in Anthony. 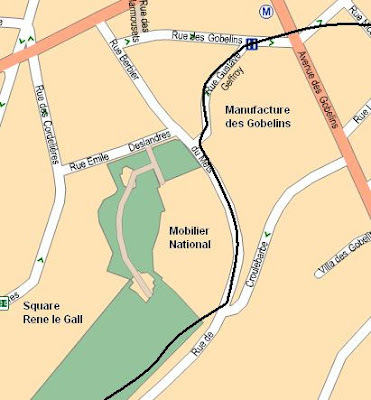 Never much larger than a narrow stream, the river nevertheless previously wound its way through the streets and gardens of the 5th and 13th arrondissements of Paris, serving trade and industry, before finally joining the Seine beyond the Jardin des Plantes. What trace would I be able to find of this river today? I decided to choose one part of the city where the river previously flowed and, like a man carrying a divining rod, try to dowse out sources of water. The natural place to begin the hunt seemed to be the Square René Le Gall in the 13th arrondissement, previously the gardens of the Manufacture des Gobelins and known as the ‘ile aux Singes’ (Monkey island) at the time of the Bièvre. Transformed into a neo-classical style park in 1938, almost at the same period as the neighbouring Mobilier National building, it is still quite easy to imagine how this stretch of land used to be. It was a place of leisure for the workers of the Manufacture des Gobelins (where cloth and tapestries were made), and filled with spots where they could dance and drink beer. The garden was an island between two stretches of the Bièvre, and monkeys skipped about freely amongst the revellers. The water of the Bièvre were used in the manufacturing process in the factory above, and the workers beer-rich urine was believed to improve its quality! 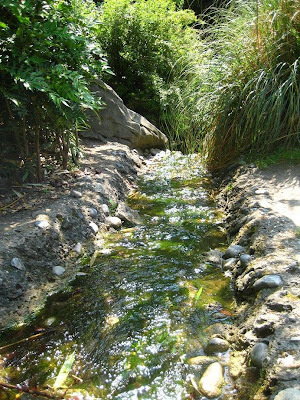 Today, a line of poplar trees marks out the Bièvre’s ancient path, and an artificial bubbling brook has been added to give an impression of the river. It is a pleasant bucolic spot, and it is easy to imagine the river resurfacing here. Indeed, it is one of four spots chosen in Paris where this could become a reality, and the point where what is left of the river is closest to the surface. Leaving the park, it is easy at first to follow the Bièvre’s path as the streets have kept the same sweeping movement of the river. The Rue Croulebarbe and the Rue Barbier de Mets were once the banks of the river, and a row of buildings still stand witness to this period. This is what is known as the ilot de la Reine Blanche, a series of houses and buildings where fabrics were cut and dyed, all naturally taking advantage of the river that flowed by. I follow the narrow streets up to the Avenue des Gobelins, but here the 19th century Haussmannian infrastructure makes me lose track of the river. At some point it snaked past the Jardin des Plantes then took a last dive into the Seine. In truth it's hard to imagine the river ever making a comeback in such a dense urban environment. The Bièvre was eliminated from the city when it became a foul smelling danger to people, thick with industry waste and the blood of animals, so would it be realistic to bring it back today as a simple trick of urbanists? In reality it will never happen. The face of the city has changed and the course of the river has been wiped away. The Paris administrators did look into the possibility of opening up four stretches in the city, but found that even this would cost them 100 million Euros. A purification station would need to be built at the entrance of the city and the underground stream would need to be carefully untangled from sewer pipes and Metro tunnels. It has been condemned to stay out of site and serve only to wash away our waste. 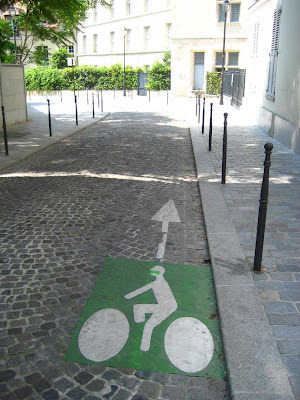 In its place, the city of Paris chose the much cheaper solution of placing some metallic markers on the ground along the river's path. For the rest, you'll need to use your imagination. Note: This subject is a vast topic. I will try to come back to it again in the future, hopefully if I can talk to somebody who would like to bring the river back or from the group of artists that celebrate this heritage (the Lez'arts de la Bièvre). I will also try to create a Paris 'Bièvre' walk - that will be made available for free of course! The Bièvre story is one of the most fascinating one about Paris I think. Anyway, I am sad to hear your pessimistic prognosis, as they had talked about uncovering the section on the annex grounds of the Muséum d'Histoire Naturelle, perhaps fifty yards from my little Paris hideaway (anything to brighten the neighborhood). But I suspect you are right. They had been twisting, turning and having their way with that stream for so long, it all seems far fetched. I didn't know that the idea to uncover it was definitely abandoned, unless... ! Somehow, I can understand the decision to cover it, when that decision was taken; it was obvioulsy not that attractive any more and of course completely polluted. Today, you would see it differently, it would be a nice attraction. If your read about rue de Bièvre, it indicates that the river passed there. However all maps indicate that it reached the Seine close to Austerlitz, as you say... ? Was there a "delta"? Several years ago, there was a great family restaurant on rue de Croulebarbe named La Touraine (which according to Google street view, is still there). I guess they were just closed for renovation, because it's a lot bigger now than when we had dinner there. What a sad story... the inevitable (?) "progress" of man and his cities at the expense of flowing water. Makes me think of the Glen Canyon Dam, another case of flowing water perverted, diverted, converted to something totally and tragically other than what it was. Peter (the other): What's 100 million Euros indeed! It is a figure that seems to have scared them off though, because I think they really were serious about uncovering it once. Peter: It seems to be a very difficult river to trace, although there is much mention of 'bras morts'. I guess the Rue de Bièvre connection is one of those, and yet if it got that far, you'd think it would also have reached the Seine. Starman: I didn't know that one, but I've just done a little research and it looks nice! Owen: It seems that most cities have a similar story, but when we think of the polluted disease ridden pools they must have been it's easy to understand why they were made to disappear in the name of 'progress'! What a fascinating post - I love stories like this. We stayed a block from the Jardin des Plantes last summer. Of course it's romantic to think of a little stream flowing through the city - I'm sure the reality was always pretty smelly. 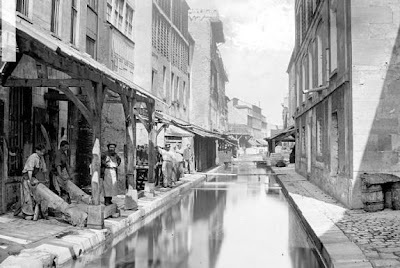 I've read that the Bievre runs through a tunnel beneath the Paris Mosque that during WWII was used to lead fugitives to pacquet boats on the Seine that carried them to safety. Do you know anything about this story? Can you pinpoint the spot where the tunnel gave onto the Seine from which the boats would have departed? Would it have been Quai Saint Bernard or Quai Austerlitz, or...? thank you for anything you can pass on about this. Great post! Well written and researched about a great topic on "old" Paris. 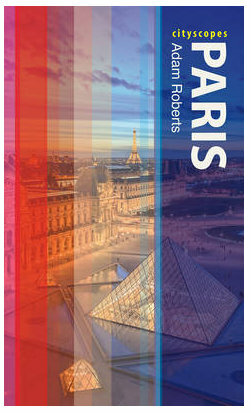 I'm doing some work on my own on Paris and found your blog quite helpful. Thanks! From http://written-in-stone-seen-through-my-lens.blogspot.com. Interesting blog, thank you. I am an artist researching hidden waterways in Paris, so I found your writings very interesting. Bid you create a walk? Would be interested to walk it if you diid. Earth Law Center is partnering with Notre Affaires a Tous (Valerie Cabanes) to seek rights for La Bievre and as a result, petition for it's uncovering. if you know of any experienced Paris-based lawyers who might be interested in working with us on this - or local environmental activists, can you email me at Darlene Lee, dlee@earthlaw.org? Thank you!